Home » NFL » Super Bowl Prediction: Survival of the Fittest! Super Bowl Prediction: Survival of the Fittest! 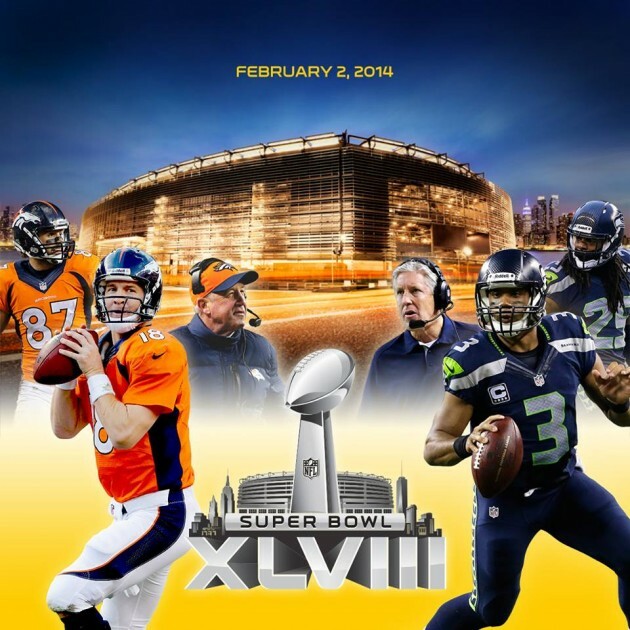 Game Information: Seattle Seahawks vs. Denver Broncos @ MetLife Stadium (NY, Central location) on Sunday (Feb 2nd, 2014) @ 6:30pm EST, TV: FOX. Seattle Seahawks: Percy Harvin (WR) Probable with a concussion. Denver Broncos: Knowshon Moreno (RB) Questionable with a rib injury. Previous matchups: – None in the 2013 regular season. Seattle Seahawks: Use Marshawn Lynch to set play action and screen options. Denver Broncos: Use all of the offensive weapons to over power Seattle’s secondary. Game Analysis: It’s the game we have been waiting for; the one everyone wanted to see. It’s been a few years since both number one seeds made all the way to the Super Bowl but now only one can take home the Lombardi Trophy. It’s the perfect storm the Denver Broncos have the number one offense and the Seattle Seahawks have the best defense since the 85′ Bears. This will be the true test for both teams. The Broncos started off the season looking like they were unbeatable until week seven, when the Indianapolis Colts handed them their first loss of the season. Then they would go on to win a few more games but in week 12 the Patriots would be responsible for their second loss of the season. The rest of season was smooth sailing until one Thursday night when the San Diego Chargers came to town. The Broncos would finish the regular season with a great record of 13-3. Then came the toughest part of the year, the playoffs. Their first matchup was against the division rivals, the San Diego Chargers. Peyton Manning would lead his team to victory continuing on to the AFC Championship. On the other side was Manning’s nemesis; Tom Brady but this time the Broncos manage to squeak out a win. Now one game left and all they have to do is win. Sounds too easy right? The Seahawks also started off the 2013 season on a hot streak. They would take the first five weeks with easy going a perfect 5-0. Then came week six where the Indianapolis Colts would hand the Seahawks their first loss. Strange how the Colts manage to beat both Super Bowl teams, but never got the chance to prove if they could beat them in the postseason. The Seahawks would then go a second winning streak beat the next seven opponents. Then in week fourteen the 49ers would the Seahawks their second loss but it wouldn’t be their last. The Arizona Cardinals would hand the Seahawks their third and loss of the 2013 season. Finally in the playoffs they beat the Saints and the 49ers and now they have a chance at being world champions. These two teams may go about beating opponents in different ways but both are very effective. Both the Seahawks and Broncos finished the 2013 season with the same record (13-3) putting them at the top of their conferences. September 19th, 2010 was the last time the Broncos played the Seahawks. Peyton Manning was still on the Colts and Russell Wilson was still playing for Wisconsin University. Oh how the times have changed, Richard Sherman was still attending Stanford the last time these two teams met. Three years ago it didn’t mean much when these two teams met now it’s the most important game in the life of these athletes. Every NFL player in analyzed by how many rings they have, sorry Dan Marino. Peyton Manning is known as one the best quarterbacks to ever play the game but only one ring after fifteen years. On the other side, Russell Wilson one the last QBs picked in the 2012 draft now is playing in the Super Bowl. Both quarterbacks would like to win a ring but only one can, so who will it be? As the referee tosses the coin to determine who will get the ball first Peyton says tails, it lands head side up. Seahawks choose to receive hoping to score first then overpower the Broncos with their great defense. This strategy works great as the first drive unfolds Russell Wilson rolls out to throw the first touch down of the game to Percy Harvin. Then Broncos seem to have some issues and punt the ball on their first possession. The Seahawks offense drives to the fifty but then everything comes to a halt. A few bad penalties later and Seahawks are faced a third and long. Russell Wilson delivers a screen pass to Lynch and says Beastmode Go! Lynch breaks off defenders left and right making them child’s play as walks his way into the endzone. The first quarter would end, as the Seahawks would fly away with an early 14-0 lead. In the second quarter both offenses would have a hard time scoring; until Matt Prater kicks a sixty-five yard field goal breaking his own record. With that field goal the Broncos felt momentum shift back to their side. The Seahawks would be forced to punt on their next drive, but only a minute remanded before Bruno Mars would take the stage. Peyton Manning looks up and says, “perfect, time for me to yell OHAMA and force the Seahawks offside.” Well sure enough Michael Bennett jumps the gun and the Broncos get a free play. Peyton lobs it up to Demaryius Thomas and away he goes giving the Broncos their first touchdown. The first half would end with the Seattle Seahawks leading the Denver Broncos 14-10. As the teams take the field for the second half the Denver Broncos put Trindon Holiday back to receive the kickoff. Holiday catches the ball at the fifteen-yard line a short kick and runs the ball back for a touchdown. With Matt Prater about kick the extra point they fake it and make the two-point conversion. After just two plays in the second half the Broncos now have their first lead of the game. As the rest of the third quarter plays out the Seahawks would kick a thirty-yard field goal to shorten the lead to one point. The third quarter would end with the Broncos leading the Seahawks 18-17. The Broncos receive the kickoff after the Seahawks field goal hoping to expand their one point lead. The Broncos get a few first downs but the drive stops at Seattle 33 yard line, forcing another long field goal. As Aaron Brewer snaps the ball, it goes high over Matt Prater’s head. The Seahawks pickup the bad snap and return it for a special teams touchdown, giving them the lead again. Both defenses hold steady until 1:39 is left on the clock. With just a little over a minute left Peyton Manning leads his team down the field throwing a screen to Julius Thomas. Touchdown! Matt Prater kicks the extra point and the Broncos win Super Bowl XLVIII. Score Prediction: 25-24 Denver Broncos win!